Onboard Truck Scales fitted to a skip bin truck increased collections profitability for a Perth based hirer of skip bins. 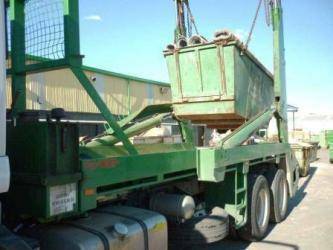 Supplied by Accuweigh’s Willetton branch, the Onboard Truck Scales allowed the driver to select the most economical landfill site for dumping the bin contents based on material weight. Accuweigh’s Onboard Truck Scales ensures cost-effective dumping is possible by eliminating under-estimation of bin weights which can significantly reduce the job’s profitability. As there is no universal fee structure of WA’s dumping charges and weights at landfill sites, it is up to the individual drivers and operators to select the most cost effective landfill site at which to discharge each bins contents. “You can’t manage what you can’t measure” and Accuweigh’s Onboard Truck Scales provides accurate weight measurement of the skip bin’s contents upon which landfill fees are primarily based. The Accuweigh 30945 underbody loadcell system provides accuracy greater than 1% of capacity ensuring accurate measurement and potential control of business expenses. Accuweigh is the exclusive Australian distributor of the PM Onboard range of Onboard Truck Scales – some of which are trade approved to allow client invoicing based on product weight collected. Eight branches across Australia provide Superior Product Support on all industrial scales and weighing equipment. Which Weighing System Do I Need When It Comes To Warehousing?